A lackluster camera hinders what is otherwise an attractive and speedy package in the newest HTC flagship, the HTC One M9. The latest addition to the flagship HTC One series might not see a massive departure in design from its predecessor, but it does bring more refined aesthetics and an improved software experience, along with a shift in focus away from the Ultrapixel camera, even if it’s not completely gone. When a jump between generations is evolutionary in nature, the question that is on everyone’s mind is whether the latest iteration does enough to differentiate itself from the rest, including, and maybe especially, its own predecessors. That’s what we find out, in this comprehensive HTC one M9 review! In recent years, complaints have been few and far between when it comes to the design and build quality of HTC products, and this goes doubly for the flagship One series. The company’s now iconic design language returns with the new HTC One M9, this time essentially molding together the best features of the M7 and M8 into a single device. A sharper edge returns with the M9 and rises to meet the panel up front, resulting in a deliberate separation between the two sides. The frame has also been given a coat of paint, with the main version of this phone sporting a subtle hint of gold that isn’t too gaudy, and blends in well enough to create a phone that is actually quite neutral in its coloration. The new edge certainly helps with the phone’s grip, but also means that the M9 is a bit meatier than its predecessor. As with past iterations of the One family, the front facing BoomSound speakers are a design headline of the HTC One M9, bringing with it a great audio experience for media consumption that is rivaled by few other smartphones on the market. The camera optics up top might look a little bigger this time around too, thanks to the Ultrapixel camera that now is found on the front. And yes, the black bar housing the HTC logo is still found below the display. While the black bar may be a bit of a sore point for some users, it’s really not that much of a bother. Turning to the back, we are greeted by a brushed metal design, given the same subtle tone down that was seen with the One M8. The material feels better this time around though, so fear of the device slipping out of your hand isn’t as prominent as it may have been last year with the One M8. Coupled with the new edges on the sides, this might be one of the best HTC One phones in terms of handling. When it comes to the camera optic package, HTC now packs a 20.7MP rear shooter, this time forgoing both Ultrapixel and Duo camera setups. As far as the button layout is concerned, the power button and volume rocker are all found on the right side of the device. The power button is textured differently from the others, which helps with recognition, but one thing that we noticed is that it is actually a bit too low on the phone. This might not be an issue for left handed users, but when trying to wake the phone with the right hand, you have to reach down a little lower than might be fully comfortable. All in all, HTC continues to create one of the loveliest designs with their flagship devices, and the One line could be credited as the shining (almost quite literally) example of how a flagship device could be constructed. Though it got a smidge thicker, and the sharper edges will cause a bit of a pinch in the hand, it all contributes to the handling experience. There’s no denying how good the phone looks, how much better it feels now, and how the old adage of “if it ain’t broke, don’t fix it” applies here, and we applaud HTC for sticking to their guns and keeping the design of the One M9 pretty familiar for that very reason. HTC also sticks to a tried and tested display experience provided by a 1080p panel that will look and feel incredibly familiar to anyone who has used a flagship phone from the past year or so. At 5 inches, this screen also pumps 441 ppi, adhering to the standard that we’ve been enjoying for quite some time now. Though Quad HD is the new fad these days, HTC seems to understand that it could hurt battery life, and preferred not to risk that happening with their current flagship. That being said, you’d be hard pressed to notice much of a difference at this screen size. Colors still look quite rich, though the blacks on this Super LCD3 screen might fall short of the contrasts found on AMOLED panels. At least this review unit shows a warmer display than previously observed in HTC One devices, which isn’t a negative, but rather just a detail worth mentioning. Keeping the display size at 5 inches was a good choice, as its narrowness makes up for the additional real estate found at the top and bottom of the device. Text looks as sharp as it should, and media consumption and gaming are a blast on this display. Perhaps one day we will get an HTC device with a QHD display, but for now HTC appears to be more focused user experience, and not about the raw specifications. Considering how nicely the display continues to perform at these specifications, we’re not complaining. In the case of the One M9, under the hood you’ll find a quad-core Qualcomm Snapdragon 810 processor, clocked at 2 GHz, backed by an Adreno 430 GPU and 3 GB of RAM for graphics and multi-tasking. As you would expect from the latest and greatest, the HTC One M9 packs a lot of power and speed. As good as the processing package may be, a contributing factor allowing for this performance is the latest iteration of the HTC Sense UI. Even though the Snapdragon 810 has received some flak since its availability with the LG G Flex 2, the HTC One M9 does well to showcase its power with a software experience that is spartan enough to consistently perform. Transitions in and out of the general interface are smooth, and a noticeable shortening of certain animations further lends to the flying speed of this next iteration of the interface. Even multitasking is a breeze, as HTC opted to keep their grid layout as the default recent apps screen, instead of the card-based interface introduced with Android 5.0 Lollipop. One aspect of this processor that has received a lot of criticism lately is something that has to be addressed. I don’t perform a lot of heavy benchmark tests anymore, instead giving more importance to the day to day experience, but new reports have suggested that the device tends to get really hot during such tests. This obviously hasn’t been the case for me, but it has to be said that the phone does get very warm under certain kinds of load, such as when gaming for extended periods of time, or when using the phone with a turbo charger. It may not have been enough to put the phone down in discomfort, but it is still quite noticeable. Hardware takes on a pretty similar outlook as found in previous iterations, with the media consumption experience still taking center stage, with 32GB of storage built in that can be further expanded up to 128GB. As mentioned above, the BoomSound speakers return but this time are backed by Dolby enhancements, which can be easily found in the setting screen. A simple tap of the option will change the mode from Theater to Music and back, allowing for a bit of an equalizer effect that can bring out better sound, depending on what you’re doing. This front-facing speaker combination still stands as one of the best out there for everything from music and videos to gaming, and it is still quite surprising that not a lot of other OEMs are jumping on this bandwagon. The speakers even work well for speakerphone calls, and the call quality is still as good as it should be, with no dropped calls or complaints on either side during a call, while on the T-Mobile network. It has to be mentioned that this is an international model of the One M9 and as such, I’ve not been able to use LTE with it. HSPA+ has been very reliable though as the type of 4G connectivity I’ve been using, but it is something to watch out for, especially when it comes to picking up an unlocked international version. The only real bit of plastic still available on the One M9 is up top and it houses the IR blaster, serving as a remote controller for TVs and set-top boxes. The One M9 does make for a pretty cool remote, as you can also get a quick glance as to what else is on via the TV application. Turning on the phone from the prone position can still be done using the Motion Launch gestures, which detect the phone being brought up first, after which you can double tap the screen to wake, swipe a number of ways for other functions, or hit the volume down button to quickly get to the camera. Finally, an embedded 2,840 mAh battery brings with it a somewhat above average battery life to the phone. Typical day to day moderate usage makes the phone last up to a day and a half with ease, though the power user will likely have to take advantage of the power saving modes and the fast charging capabilities that come with it. As an example, with a day that was full of gaming and picture taking, the battery died just past the 10 hour mark. Basically, we’re still looking for a better outlook in the battery life department, and it seems fast charging is the consolation prize we’ll be given until that time comes. The camera has always been a big point of contention when it comes to the HTC One series since its inception, but this time around, Ultrapixels and their claims of good low light performance are now relegated to the front of the device, to serve as an enhancement when it comes to taking self-portraits. Not surprisingly, this is a great move on the part of HTC, with this camera fitting perfectly into its new role. Even without the use of a flash to fill in the darkness, this front-facing unit works better than the competition for getting good shots in poorly lit situations. Of course, the real story here is the 20.7 MP optics that is now found at the back of the phone. Starting with the camera software, you’ll find quite a few different options here including split capture and photo booth that return from the Desire line, which are a couple fun ways of capturing memories. If you actually miss the Duo Camera for its depth of field capabilities, a Bokeh mode tries to alleviate this by using the more conventional method of taking multiple shots of the same scene in order to make the subject pop. It works pretty well, and the speed of capture further proves that this is a better method than last year’s oddly uneven Duo camera. Video capabilities now include 4K recording, though the lack of optical image stabilization could result in some shaky footage. While you’d expect the move to a higher megapixel count to equate to a much better experience than found in the M8, we are sad to say this isn’t the case. This is largely because the way the phone processes picture data is about the same as before, and that’s not a very good thing. Even smaller pictures from the Ultrapixel optics would be fine if the noise was processed in a better manner, but the poor post processing of the data in the 20.7 MP pictures are exacerbated when zoomed in. An f/2.2 aperture is not too shabby, but the camera still has to opt for the highest ISO limit of 1600 to fill in the darkness, which will inevitably lead to noise in the pictures. Zooming into the photos shows a lot of artifacts accompanying the noise as well, including a smudging effect that is supposed to help, but only makes the photo look less accurate in detail. Though a higher megapixel count might be nice for the general user, the camera still suffers from the same low light issues as its predecessors. In much better lighting situations, more usable photos can be had, but there are issues there as well, mainly with exposure. HTC opts for the typical metering based on the point of focus, but this doesn’t take into account what is around that point, resulting in often blown out portions of pictures, or the opposite, if you choose to focus and expose on a much shinier portion of the scene. It’s almost as if the scene itself has to be perfect, or at least have even lighting in order to yield a great shot. That said, good photos are definitely possible with the One M9, but are certainly not as common as we would like. HDR does help a little bit to even out the exposures, but it isn’t a practical feature to use, especially when the shutter speed has to be very slow to get a decent shot, requiring you have to keep steady for a long time before processing even begins. One thing that we are eager to test out is the supposed Pro mode that is coming to the One M9, where photos will be taken in RAW format, but the mode won’t be made available until a future update. The reason why I want to test the Pro mode is to take a RAW photo and do my own post processing in a program like Lightroom, which might help show just how important it is to process picture data properly. I have already mentioned that the software is simply a very fast version of Sense powered by the Snapdragon 810, but the new version of HTC’s UI has a few new tricks up its sleeve. A general look at the interface will be very familiar, with the vertical app drawer, darker tones all around, and the inclusion of the Blinkfeed second screen feature all continuing in this iteration of Sense. Worth mentioning is the fact that, for some reason, the default HTC keyboard is something I’m not a big fan of. Typing on it felt slower than on other Android keyboards, with an auto correct experience that was uneven at best. Blinkfeed is still one of the best second homescreen additions available, and its customization certainly adds to it, allowing you to pick and choose exactly which publications and feeds you would like to get new stories and updates from. Now, there are a few contextual additions like food recommendations that pop up especially around meal times of the day, with certain blocks that will appear to suggest places to eat. This might not be too useful for everyone, but at least the effect isn’t too invasive. Sense itself jumps to version 7.0, and while things remain largely the same aesthetically, this update brings with it two new features, the Home widget and the Themes engine. The Home widget is basically a place where you can find your most used applications, and it changes based on your contextual location. It works fairly well, keeping in mind how often you use certain applications in multiple locations. The folders that accompany it provide an easy spot for your most recently downloaded applications, along with a folder for suggestions on what to install next, which could be useful, but can thankfully be turned off if you don’t want it there. The Themes engine is perhaps our favorite addition to Sense, as it changes more than just the colors of the UI, and is one of the most customizable first party iterations we’ve seen on a flagship device. While there are already a bevy of themes available in the store, you can also create your own by taking your homescreen wallpaper and letting the theme engine find the colors to match it. This is a pretty powerful customization tool that we feel many users will take advantage of. Apart from these key additions, HTC keeps Sense fairly simple but still very elegant. The contextual suggestions in both Blinkfeed and in Sense Home can all be turned off, so that eliminates any problems people may have with them, and the Themes engine is a bright spot for what is already one of our favorite iterations of Android, because of not only how fast it is, but also given the fact that it is one of the most accessible for the general Android user. Official price points for the HTC One M9 are slowly trickling in, and the phone is available for pre-order now. We expect the price of the One M9 to come at the premium price for contracts and at least $600 off contract, which is typical for flagship devices. Competitors in the same bracket include the different flagships coming out this year like the Samsung Galaxy S6. Its predecessor, the HTC One M8, has to be mentioned here as well, as it might soon be available for a bargain, especially if you think that its successor hasn’t really done enough to distance itself from its past. 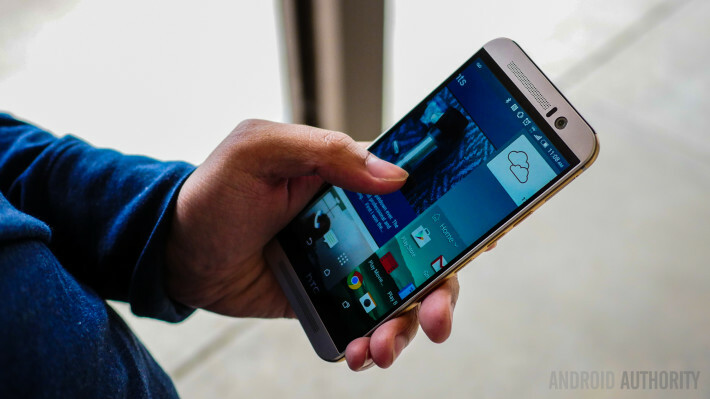 So, there you have it – an in-depth look at the HTC One M9! As has been true for previous generations, the latest HTC flagship brings with it a beautiful package, with lovely software, and only one gaping hole in the camera experience. While it isn’t the worst shooter in the high-end market, it does feel a few steps behind the competition. For many users, this feeling might permeate throughout the device, as much of the One M9 feels quite familiar. Of course, others may consider this familiarity a good thing, at least as far as design and software is concerned. Further refining what made the One M7 and One M8 so desired keeps this phone looking and feeling great, and underneath the surface, users can be sure that they’re getting a top notch user experience in the speedy, functional, and not too cluttered Sense UI. The One M9 is still a compelling choice for a daily driver, as long as the budding smartphone photographer can look past the camera deficiencies. Though a rethinking of their camera processing might be in order, we fully applaud HTC for sticking to their guns in basically all other aspects of this phone, as veterans and newcomers alike can enjoy the best that HTC has to offer in the One M9.